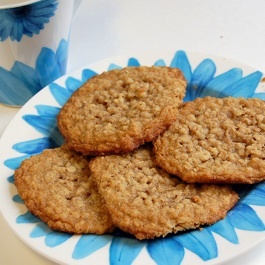 It took me a surprisingly long time to find an oatmeal cookie recipe that I wanted to try (about 10 minutes, which is practically forever if we’re talking about “Google time”). I just wanted plain, thin, and buttery oatmeal cookies. I finally adapted a Chewy Chocolate Chip Oatmeal Cookies recipe from All Recipes, and in the end it worked pretty well. I ended up baking them one tray at a time. The first tray is what you see pictured. The cookies spread out a bunch (’til they touched each other) and were very flat. While the first tray was in the oven I put the remaining dough in the fridge to cool. When I dropped the chilled cookie dough onto the next tray I also used smaller portions, and the result was a batch of slightly thicker cookies. So if you want thicker cookies, chill the dough first. 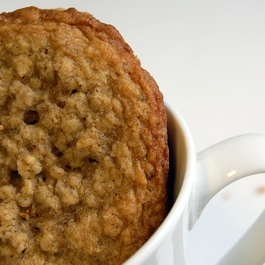 And don’t flatten the cookies with your fork; they’ll do that themselves while they’re baking. I prefer the thin versions, but you do have to be careful to let them cool before you lift them off the tray, or else they’ll fall apart. 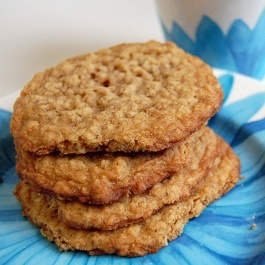 Anyways, these are great if you like your oatmeal cookies thin and buttery. In other news, my Ph.D. applications are finally all done, and I just sent the last three (of six) application packages off this morning using Xpresspost. It’s odd that of the schools I applied to, the advantages that each one has varies quite a bit. One has a professor with research interests more similar to my own than any other. Another is the home of one of my favourite journals. Another is one of the few schools doing research into digital media and new literary mediums. Then there’s the one with the crazy library resources. We’ll see what happens, I suppose. 1. Cream butter and sugars until smooth. 2. Add eggs and vanilla. Beat until smooth. 3. Mix flour, baking soda, and salt in a separate bowl, then add this to the wet mixture. Fold in the oatmeal. 4. Bake at 325 degrees Fahrenheit for 11-13 minutes. Let cool on the pan for awhile, unless you want them to fall apart on you (especially if they are very thin).